Google's announcement and launch of Android 4.3 Jelly Bean has sent the smart phone manufacturers in a tizzy mode to bring their customers up to date with Android 4.3 Jelly Bean. It is already known that the Google's Nexus will be first to get the update or upgrade followed by Google Play Edition's of Samsung Galaxy S IV, HTC One. In fact some users of the Google Play Edition versions of HTC One and Samsung Galaxy S IV which are easy to update because they do not use the TouchWiz, have already reported receiving the update. The update they received shows the Build No. as JWR66V and the S IV version is 180MB in size whereas the HTC One version is 150MB. 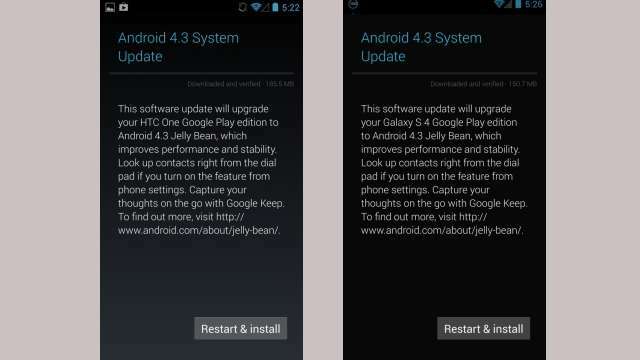 The images below are a proof that the HTC One and Samsung Galaxy S IV have indeed received the updates. That fixes the Google Play Edition versions but what about the smart phone manufacturers own devices. Below is a comprehensive list of all the major manufacturers who will be updating their respective models as mentioned to Android 4.3 Jelly Bean. Sony : Sony, as I have already written earlier here, has already announced a roadmap for updates for its devices officially(it is the only one thus far). The following Sony devices will get Android 4.3 Jelly Bean update. Samsung : Samsung has been surprisingly mum about the updates for its devices. It hasnt even said anything about a update for its flagship Samsung Galaxy S IV. However as the Google Edition of Galaxy S4 is already being updated to 3.3 update, it wont be long before the regular devices from Samsung are updated. The list below gives a probable list of candidates for upgrade (though Samsung hasn't confirmed it). And there is news that some of Samsung devices may skip the Android 4.2 to directly update to 4.3. However Galaxy Note 8.0 including the LTE version will only get a Android 4.2.2 update, which Samsung has started rolling out yesterday. S 2 Plus and Galaxy Tab (some versions) are also not getting Android 4.3 any soon. In fact even I was writing this article, Samsung has started updating Samsung Galaxy Note 8.0 LTE (GT-N5120) via Samsung’s Kies desktop software. Please do check for the update if you own one. 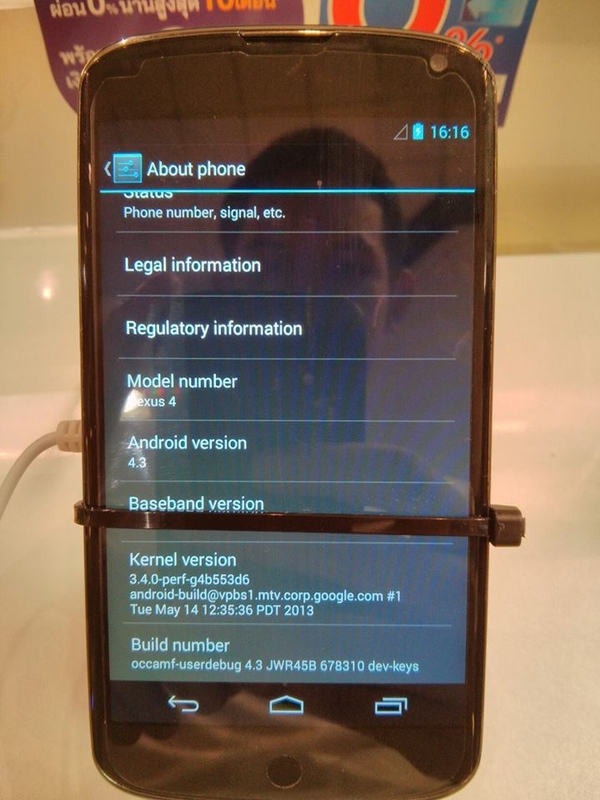 LG : Just like Samsung, LG hasn't issued any official release regarding updates but since Nexus 4 is getting one, it is safe to assume that others will follow suit. Remember Optimus G is very similar to Nexus 4 on the insides. The following LG devices may get updated soon. HTC : HTC will be the only loser in the Android 4.3 Jelly Bean race because it just had 4 major launches this year and HTC One is one of them along with HTC One Mini. As I have already said above, since Google Play edition of HTC One is already getting updated so it is safe to assume that HTC One and HTC One Mini will be first to get Android 4.3 Jelly Bean. Owners of other models may have to wait till October/November for their devices to be updated. If you own any one of the above devices, you must have already received it or will receive it soon. To read about all the new features the Android 4.3 Jelly Bean will bring to your device read this article here. If you want to read all the articles about Android 4.3 Jelly Bean click here and read all the posts one by one.